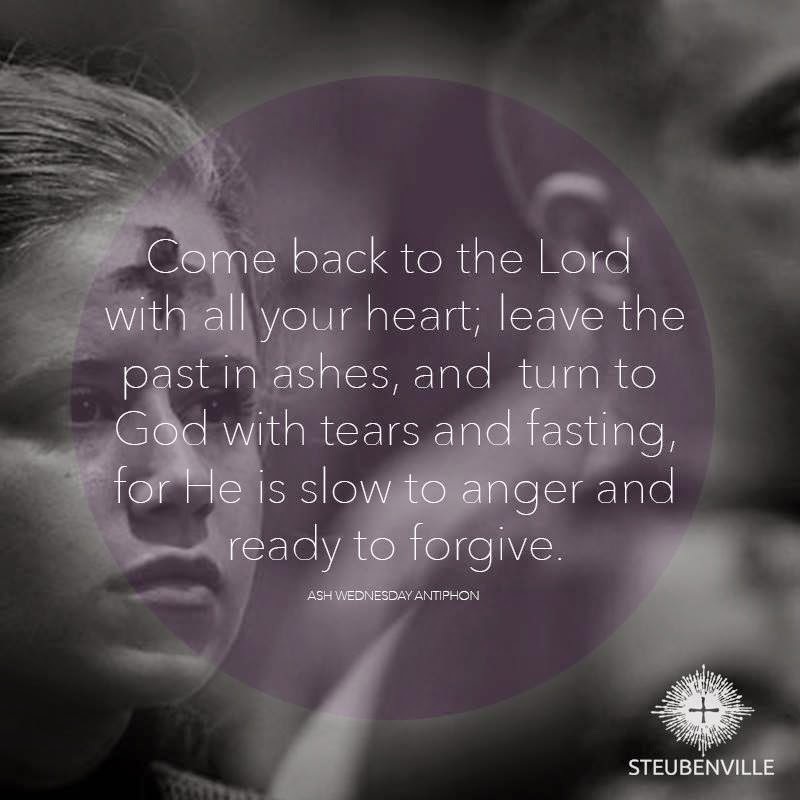 The Antiphon for Lent “ Come back to the Lord with all your heart; leave the past in the ashes, and turn to God with tears and fasting, for He is slow to anger and ready to forgive.” I want to break that apart to discuss it. The Lord just doesn’t want us to come back but do so will ALL of our heart. Not just part of it. Turning back to God is great but we need to expand on it. For example we can turn back to God and say attend mass now every week or even attend a daily mass or go to prayer services but unless we are opening our heart to Him then what are we doing? Are you just filling the obligation or just doing a check mark on a list of things you wanted to do for Lent? We need to bring our heart so it can be changed, be healed. The only way we can do this is to allow all of our heart to be exposed to our Lord. If we do not do this then we can not expect the next part in the antiphon to happen. I am the first to say this is hard at times for me. To let the past fade away and move on and forward without any of that holding me back or down. It may be that we have to heal like I said in the last paragraph. Healing our heart will allow some of this to happen. We can leave those past hurts or disappointments behind us. We have to allow the “What If’s” and the “Maybe if I”.. stay there. We do not get the chance to do it over but we can learn from it and let it stay in the past. That includes our sins. Things we have done to damage or cut the ties with our Lord. We have to be ready to leave it in the past. That now leads us to the next part of the Antiphon. When we turn to the Lord with all of our heart and are ready to leave what we have done in the past we find tears in our eyes and an emptiness. We may be sad for what has gone on or upset of the lose of who we are to be in God’s eyes, the person He created us to be. The tears show sorry and sadness. The fasting comes from the emptiness that has to come from us so we can be filled again with what God intends for us. I know when I am upset I don’t want to eat and can not eat. It is a fasting not by my own but from inside of me. I feel that this is a way for our bodies to show the emptiness that is truly going on within us. When I am at the bottom, the low of lows, the darkest spot, the tears flow within my soul. I feel that emptiness and all I want is to turn to God. The tears allows us to flow into the next part of the antiphon. When the heart is turned, the past is settling in the ashes and our tears are falling we can now turn to God and see how He is slow to anger and ready to forgive us. As a Catholic, we have the blessing of the sacrament of Reconciliation. When we are ready to ask for that forgiveness we will get it. We have that heart that is seeking the forgiveness. Our tears show our sorrow for the sins that have damaged and hurt our relationship. Our fasting is showing our readiness for penance for the past sins we are asking forgiveness for. God wants to forgive, we just have to have the pure heart and ask for it. He wants us to turn back and be with Him and do the will in our lives. Each part of the Antiphon brings us through the Lenten journey that we all should seek this year. The changing of our hearts, leaving our sins in the past as we ask for forgiveness. It is not always easy but it is the best way to live our lives. I know kneeling down and asking for forgiveness has changed my life each and every time. Make it part of your journey this Lent. Until tomorrow, God Bless, and Turn away from Sin and be faithful to the Gospel.